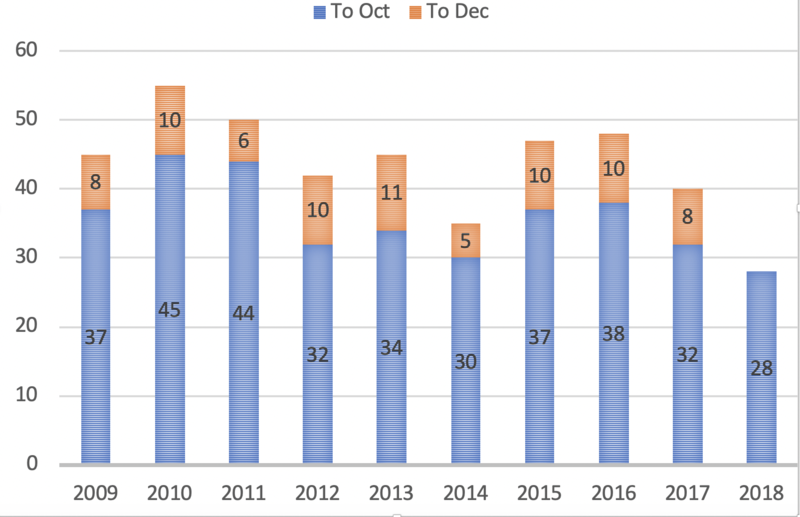 As this graph shows, November and December often add close to ten to that total, making it quite possible that the total grants by the end of 2018 will exceed 2014’s low point of 35 grants. However, it is unlikely that this year’s total will exceed last year’s of 40, itself the second-lowest of the past decade. Although the annual number of grants ebbs and flows, the recent trend is downward: from the mid- to high 40s to the mid- to high 30s. Taylor v Attorney-General (Cth), an application for judicial review of a decision by the Attorney-General to refuse consent to a private prosecution of Aung San Suu Kyi over the treatment of Rohingya refugees. Unions NSW & Ors v State of New South Wales, a constitutional challenge to NSW legislation on political donations. But 2018’s crop of such matters is hardly unusually large.Rather, the drop in special leave grants appears to be part of – and perhaps an acceleration of – a broader pattern of the Court hearing fewer and fewer cases, coming as it does at the end of a decade where the Court averaged only fifty substantive judgments a year. The reasons for these shifts in the Court’s behaviour are unclear. For instance, I have not attempted to count the number of special leave applications (a difficult task given that such applications include many often hopeless immigration and unrepresented litigant appeals) nor is there an easy way to assess whether there has been a change in the quality of such applications. That being said, the recent fall coincides with a curiously quiet time in the Court’s docket, with just three matters heard in October. There are signs that the Court itself is trying to expedite its hearings, including commencing two recent hearing days early (and skipping the morning toilet break) in an effort to wrap them up by lunchtime.Right now, the Court has twelve matters reserved and fourteen pending to be heard (not counting the secret Victorian matter whose status has not been revealed.) Possibly, the Court’s workload has been diverted to some especially difficult matters before it, such as the recent challenges to abortion safe zones or the complex native title compensation matter the Court heard in Darwin in September. Alternatively, perhaps the Court is working to clear space for future contingencies, such as a rush of referrals to claims before the Court of Disputed Returns that may accompany the next federal election. Methodology note: count based on the information here: http://www.hcourt.gov.au/registry/special-leave-applications-results-2018. I counted partial grants, referrals to the full court and s40 removals as grants. However, I counted multiple grants to appeal from a single lower court judgment as a single grant. Perhaps Australian law is just about settled? I think follows not fallows and 2014 not 2015. But is there some reason to think there would be a rush of CODR referrals after the next election? While Labor has abandoned the long standing practce of moving only to refer one’s own, it would be unwise for a Government to refer their opponents on other than seriously strong grounds. As well, prospective MPs will be taking steps before the election to put any eligibility related matters in good order. Arguably there could be more petitions to the CODR challenging results than usual now that inividuals have no means to effectively challenge MP eligibility via s 46 but given the legal costs of unsuccessful petitions, this too seems unlikely. Thanks Ross. And I should have said ’claims before’ the CDR.